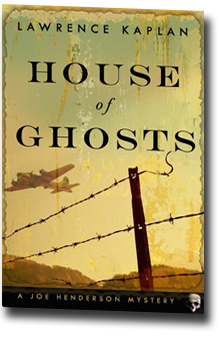 I like reading mysteries and I like reading stories set in the WWII era, so I really shouldn't have had such a hard tim e getting into House of Ghosts by Lawrence Kaplan. Maybe it's because I couldn't stand the main character, or maybe because the plot didn't kick in until 3/4s of the way through the story (Page 196, to be exact). Whatever it was, I had a really hard time staying interested. By the time I hit 196, I actually gasped. Finally, the story grabbed my attention; I stopped yawning and started flipping through pages to find out what happened. If that kind of momentum appeared in the beginning and middle, this would have been a much more enjoyable read. The story concerns Joe Henderson, a retired cop whose life is slowly going down the toilet. He's injured; on the brink of divorce; addicted to drugs of all sorts; and carrying on an affair with a married woman. When his neighbor across the street winds up dead, Joe drums up enough interest to ask some questions. While roaming through the deceased's home, wondering about the ornery old man's life, Joe comes across some interesting items - a few faded photographs, WWII paraphenelia, including an old U.S. Air Force map of Auschwitz, an official government ID, and a couple of diaries. From these, the cop begins to piece together the lives of several men - his dead neighbor, Preston Swedge, and a Jewish kid from New York named Paul Rothstein. At this point, the story veers away from Joe in 2000 back to September of 1938, when Preston enters Princeton as a freshman. It's there that he meets Clark Johnson, his outspoken, prankster roommate. Paul Rothstein's story is also revealed. The stories are not written in journal form; in fact, they're written from several different viewpoints, making me wonder exactly how Joe gets such detailed information on ALL the men's lives. Anyway, the middle chapters of House of Ghosts trace their lives from students, to political activists, to soldiers. It reveals their individual reactions to the onset of WWII, the news about discrimination against Jews and the Japanese, and the United States' entrance into the war. I know that's a dull description, and that's because the middle of the book meanders in all kinds of directions. It reads more like a history lesson than a story. Finally, when the men are at war, a plot emerges. We come back to the mystery that piqued Joe Henderson's interest - why did Preston Swedge have a map of Auschwitz? The answer, which Joe is determined to find, will chill him to the bone. House of Ghosts has a fascinating premise, one I don't think I've ever seen explored in fiction. I just wish it had tighter plotting, faster pacing and much, much better editing. A handful of historical figures appear in the story, but it's the made-up ones I'm concerned about - they were so generic and stereotypical that I had a hard time keeping track of who was who. In addition, I didn't really care about any of them. They didn't become real to me. Poor characterization coupled with a dull, lagging middle made reading this book a chore. If I had known better, I would have flipped straight to Page 196 and read from there. It's obvious that Kaplan did his homework - the historic detail was overwhelming - but I prefer my history weaved into a great story. With a bit of re-organization, I think it could have been a compelling story, but as is, it failed to capture my attention. If I hadn't agreed to review this book for Mystery Book Promotions, I wouldn't have continued past the first couple of chapters. Sorry Mr. Kaplan, but this one just wasn't for me. So I disagree with this review. Especially when it says, "I just wish it had tighter plotting, faster pacing and much, much better editing. A handful of historical figures appear in the story, but it's the made-up ones I'm concerned about - they were so generic and stereotypical that I had a hard time keeping track of who was who. In addition, I didn't really care about any of them. They didn't become real to me. Poor characterization coupled with a dull, lagging middle made reading this book a chore. If I had known better, I would have flipped straight to Page 196 and read from there." Gine House Of Ghosts a chance. You wont' regret it! I agree entirely with Susan's review. I believe Susan is the more discerning reader and not at all lazy. I was tempted frequently to grab my red pen and begin editing, then imagined sending the edited version to the author. Rather a large distraction while reading a book! I stuck with the novel because of its compelling premise - and occasional promise of something better. With expert editing and major rewrites, this book could be on the best seller list. As is, I'd be shocked to see it there and fail to understand all the rave reviews.